The product managers are assigned the task of monitoring the digital products. Their core role in the company is to deal with the designers and engineers in order to deliver a product in the market. Other tasks related to the management of the product are also handled by the product managers. They have a right to move on if they find a better opportunity. Like everyone, a product manager also goes through a situation where he has to make a tough decision of quitting his job. Some people find it very hard to communicate their decision with the supervisor of the company. A resignation letter is the best way to make your decision clear. The last day of employment should be mentioned in this letter so that the supervisor can find a replacement ahead of time. This action puts a positive impression on the mind of the reader. The main purpose of writing resignation letter is not only to describe the intention of the employee to leave the job but also informs the employer about the last day of work of the employee. In this way, resignation letter helps both the employer and the employees since it simplifies the process of transition. Resignation letter offering the help in the process of transition from the employee gives the sense of respect and amicability. 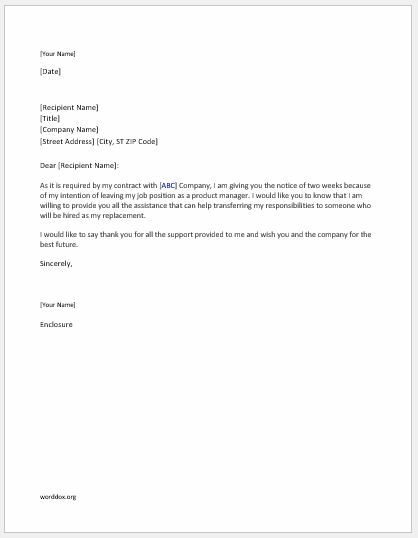 Here is a sample resignation letter was written for the post of product manager. As it is required by my contract with [ABC] Company, I am giving you the notice of two weeks because of my intention of leaving my job position as a product manager. I would like you to know that I am willing to provide you all the assistance that can help transferring my responsibilities to someone who will be hired as my replacement. I would like to say thank you for all the support provided to me and wish you and the company for the best future.